This supportive CE webinar will review non-conventional treatment options involving endodontic and restorative therapies. It will stress unique solutions to multifaceted cases. It is meant to engage the dentist’s creativity in an effort to demonstrate that there are more options to treatment than what is generally accepted…. Is straight line access necessary? Dr. Joseph Chikvashvili, Director of Endodontics, Newark Beth Israel Medical Center shows how to properly obturate a root canal. Dr. Joseph Chikvashvili, Director of Endodontics, Newark Beth Israel Medical Center shows how to fit a master gutta percha cone during root canal obturation. Dr. Joseph Chikvashvili, Director of Endodontics, Newark Beth Israel Medical Center discusses best practices for use during root canal debridement. Dr. Joseph Chikvashvili, Director of Endodontics, Newark Beth Israel Medical Center discusses properly instrumenting a root canal system. 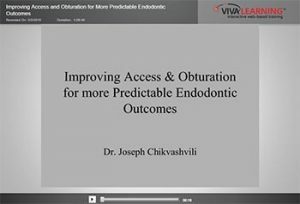 Dr. Joseph Chikvashvili , Director of Endodontics, Newark Beth Israel Medical Center discusses endodontic access.